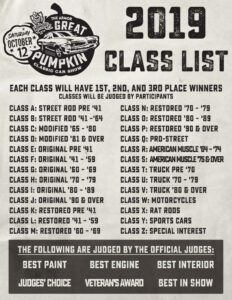 October 12, 2019, marks the date for the 12th annual ARMOR Great Pumpkin Classic Car Show. This special event is open to the public and is held in Livingston County to benefit the communities of Livingston County—with all proceeds donated to the local chapter of the Salvation Army. 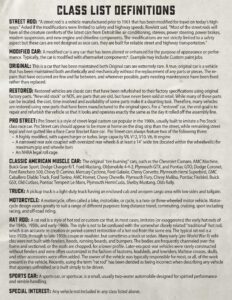 Over the past 11 years, this classic car show has grown in size, participation and reputation; from the first show held in 2007 with 40 cars, to recent years where 450 cars attended. To date, this event has raised over $154,000 and we are looking to make 2019 the biggest year yet. The car show is held at the Old Terminal of the Livingston County Airport. Day of Registration begins at 10 am and ends at 12 pm followed by judging by class with awards at 3 pm. Spectator admission is a suggested cash donation to the Salvation Army. 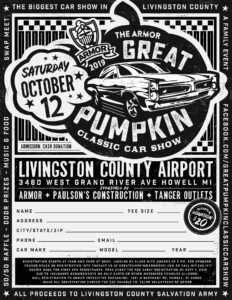 Registration is now open for the 2019 ARMOR Great Pumpkin Classic Car Show! Please mail the registration form to Armor Protective Packaging: 1551 N Burkhart Rd. Howell, MI 48855 and make all registration checks payable to: VALOR Volunteers of ARMOR. For more information, please contact us at greatpumpkin@armorvci.com or call 517-546-1117. 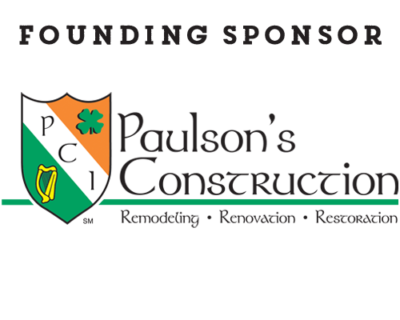 Thank you to our 2018 official sponsors!